”Circuitous” describes Deborah’s path to art. The colors, shapes, and textures of fungal spores led her to a doctorate in botany from Duke University and a faculty position at UNC-Charlotte. After twenty-two years, however, her attraction to the visual and tactile took a different turn…this time in the direction of textiles. Deborah’s work uses traditional and non-traditional quilting techniques and materials to create original fiber art pieces that play with color, texture and light. A native New Yorker, her childhood roots and background often appear in pieces that celebrate the urban experience and in quilts that explore Judaic themes. I see myself as a story-teller who writes with fragments of fabric and thread. Sometimes the fragments are photos printed on fabric and stitched into photomosaics. The storylines here lie (literally) behind the images. “Out of the Mouths of Babes,” for example, features women’s faces forming a pair of lips. However, the real tale plays out on the quilt-back where quotes from each “Babe” pay tribute to women’s wit and wisdom. Other pieces are written with fragments of fabric that might otherwise be tossed in the trash. In “Havdalah I,” light fabrics transition into dark; concentric quilted circles flow into swirls. The piece, named for a Jewish ceremony marking Sabbath’s end, illustrates the ceremony’s hope that Sabbath “light” will extend into daily life to heal a broken world. 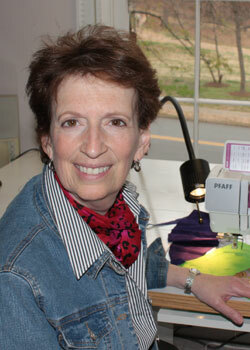 The process of “playing” with the fragments of fiber and fabric attracts me to art quilts. But over the years, I’ve come to realize that the story behind the stitching is what ultimately inspires my work.